Artistic Director and director of this production of “Gypsy,” Gary F. Bell, announces before the show that we’re about to see a scaled down production of one of most everyone’s “Top Ten” musicals. Thanks to a wonderful cast and a clever, effective set design by David Blake and Justin Been, the show works in this format. The stage at Stray Dog’s home- Tower Grove Abbey- can sometimes be a challenge with multiple set changes but these worked smoothly and made the 3 hour show fly by. 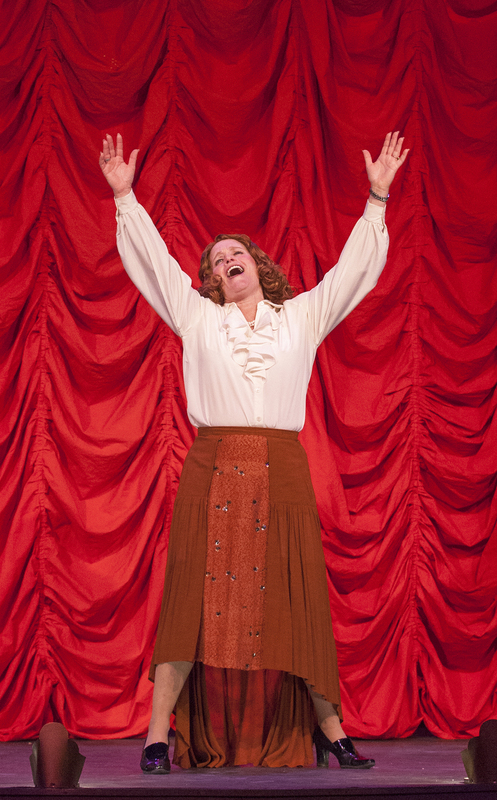 Deborah Sharn shines as the vibrant and often abrasive Mama Rose. This is a role that most musical actresses have on their must-do list and she gets to tackle it while she’s young. Her stunning first act closer, “Everything’s Coming Up Roses” will just blow you away. And a strong, almost understated “Rose’s Turn” at show’s close cements this show as exclusively hers. What a performance. Also in the spotlight is Sabra Sellers as the shy Louise who blossoms into stripper extraordinaire, Gypsy Rose Lee. Displaying a beautiful singing voice and a strong, confident transition into belated adulthood (thanks to the machinations of Mama Rose), she is nothing short of stunning. Ken Haller is a superb Herbie. Again, a strong singing voice and just the right amount of nebbishness, makes a perfect foil to the domineering Deborah Sharn. His final ultimatum is perfectly stated and fits perfectly into the dramatic side of this show. Jennifer Theby-Quinn is delightful as the grown up June who Mama grooms to be the real star of the family. Her duet with Sabra Sellers on “If Mama Was Married” is one of the highlights in a show filled with magic moments. 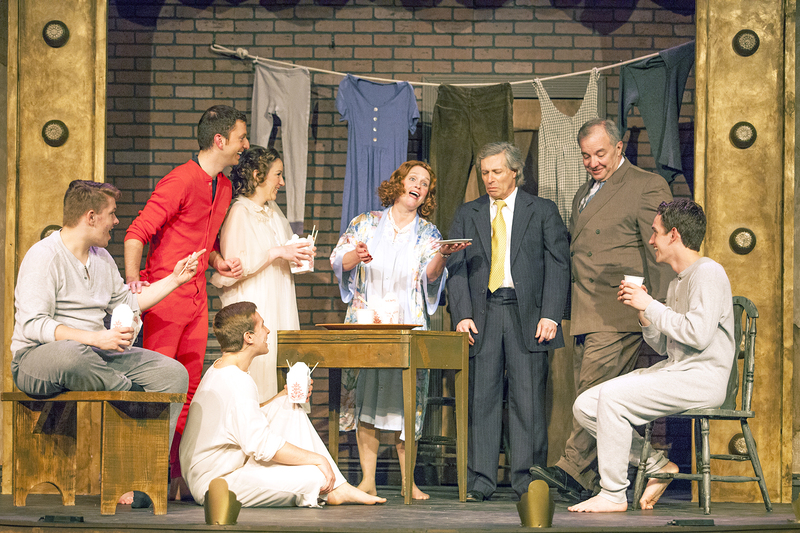 “Gypsy” is a vast show spanning a tremendous amount of time so some characters are fleeting. Doing a star turn with “All I Need Is The Girl” is Zach Wachter as Tulsa. The trio of strippers, Kimberly Still as the trumpet-toting Mazeppa, Jennie Ryan as Tessie and Paula Stoff Dean as Electra, bring the house down in their show-stopping number, “You Gotta Get A Gimmick.” The vast ensemble all do the show proud and there’s never a dull moment as we traverse from town to town with this often reluctant show business family who never quite make the grade in their efforts to “Let Me Entertain You.” This cast, however, does nothing but entertain us with a strong dedication of a masterpiece and their grasp of the era of Mama and Gypsy. and often dissonant sounds made it sound like Mazeppa may have been in the band. Hopefully this was just an off night because everything else about the show leaves you hoping it will never end. With the space problems, the delightful J.T. Ricroft choreography didn’t have a chance to bust out in full blossom either. With a book by Arthur Laurents, music by Jule Styne and the marvelous, early lyrics of a young Stephen Sondheim, “Gypsy” has long been a musical fave and a standard by which so many other shows are judged. 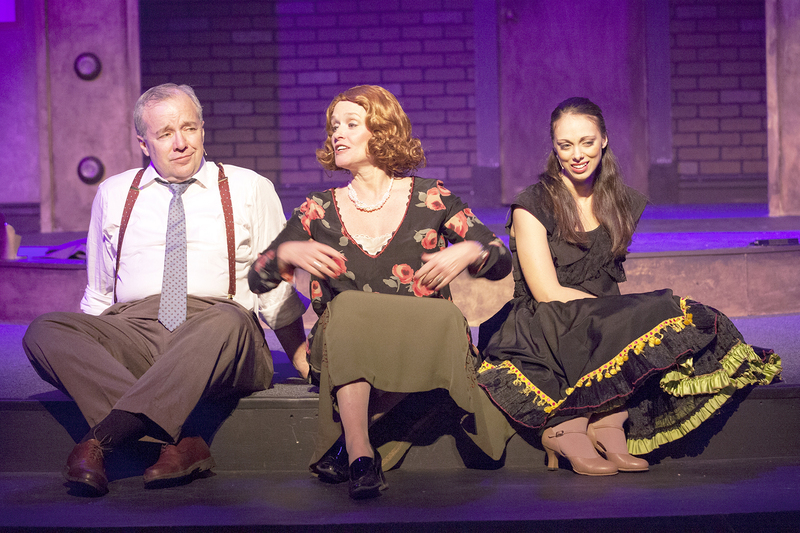 So “Gypsy” lite at Stray Dog Theatre has a lot to be proud of in bringing this huge, wonderful cast together and giving us what we want (at least what I want)- more musicals. Give Stray Dog Theatre a call at 314-865-1995 or contact them at straydogtheatre.org for tickets or more information. But hurry, the show only runs through April 20th and shows are selling out.